My Review – Let me start by saying that I really like Trader Joe’s and I really like non-homogenized milks. However, I do not like Trader Joe’s non-homogenized milk, Trader Joe’s 2% Cream Top Reduced Fat Organic Milk – Non Homogenized. First off, the cream on the top was not a nice cream that could actually be shaken back into the milk. It was instead a thick yogurt-like mat at the top that I actually had to poke with my finger before any milk would pour out! 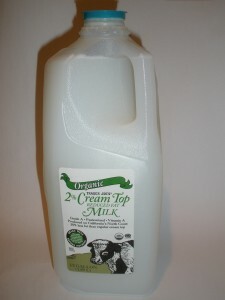 Without being able to mix the cream back in the milk tasted more like a non-fat that a creamy 2%. Bummer, I really wanted to like this organic milk.